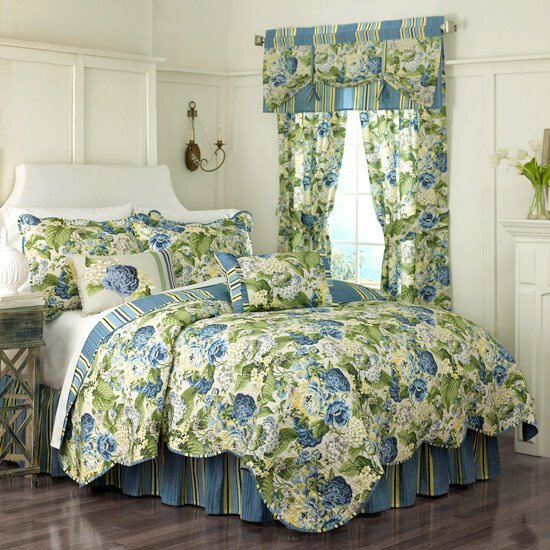 Floral Flourish Twin Waverly Quilt Set features a beautiful garden of blooms including hydrangeas and peonies in rich hues of blue, yellow, and light green on a clean and crisp ivory ground. A coordinating stripe appears on the reverse of the quilt and as trim on the scalloped edge of the quilt and the sham. Each reversible quilt is crafted of 100% woven pre-washed cotton. Twin quilt set includes one reversible quilt 68" x 86", one gathered coordinating stripe 39" x 75" bed skirt with a 15" drop, and one pillow sham 21" x 26". Machine wash cold, gentle cycle. Tumble dry low. 100% cotton. Floral Flourish Full Queen Waverly Quilt Set features a beautiful garden of blooms including hydrangeas and peonies in rich hues of blue, yellow, and light green on a clean and crisp ivory ground. A coordinating stripe appears on the reverse of the quilt and as trim on the scalloped edge of the quilt and the shams. Each reversible quilt is crafted of 100% woven pre-washed cotton. Full Queen quilt set includes one reversible quilt 88" x 90", one gathered coordinating stripe 60" x 80" bed skirt with a 15" drop, and two coordinating pillow shams 21" x 26". Machine wash cold, gentle cycle. Tumble dry low. 100% cotton. Floral Flourish 20x20 Decorative Pillow features a beautiful garden of blooms including hydrangeas and peonies in rich hues of blue, yellow, and light green on a clean and crisp ivory ground. Reversible pillow has a coordinating stripe on the other side and stripe trim at the edges. Hidden zipper closure. 20" x 20". Spot clean only. 100% prewashed cotton. Floral Flourish Lined Panel Pair features a beautiful garden of blooms including hydrangeas and peonies in rich hues of blue, yellow, and light green on a clean and crisp ivory ground. Each curtain panel measures 50" wide x 84" long. 3" rod pocket and 3" back tabs fit up to a 2 1/2" rod. Tiebacks included. Machine wash cold, gentle cycle. Tumble dry low. 100% prewashed cotton with poly/cotton lining.